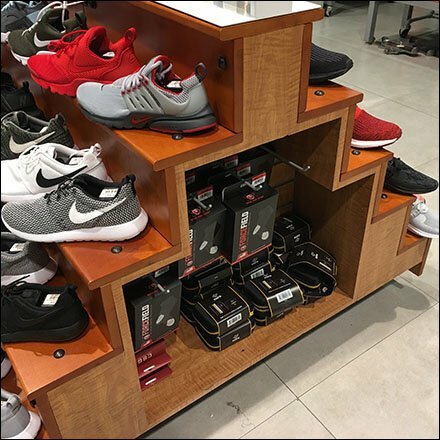 Anther example of footwear cross sell is this Ground-Level Display Hook Merchandising. Tucked into niches at the end of linear displays, they keep adjacencies and accessories truly adjacent. This Ground-Level Display Hook Merchandising seen at Champs Sporting Goods. Consider in a variety of views in the gallery of images below. “Shoe Accessory Pinterest Board“ for a visual summary. “Shoe Accessory Index Page” for all resources and links. “Shoe Fixturing and Merchandising in Retail“ for a visual summary. “Shoe Merchandising Index Page” for all resources and links.